Purpose: The objective of this study is to evaluate the fracture strength and mode of failure of endodontically treated teeth with flared canals restored with two fiber reinforced systems (glass fiber and quartz fiber) and one base metal cast post and core system. Materials and Methods: Forty five anterior teeth were decoronated at cemento-enamel junction and were endodontically treated. Post space was prepared and randomly divided into three groups according to post system. Specimens were loaded at 45° in a universal testing machine at a cross head speed of 0.5 mm/min until failure. The mode of failure was classified as repairable or non-repairable. Results: Teeth restored with cast posts have fracture strength twice that of teeth restored with fiber posts. Fiber-reinforced posts failed at a certain compressive force but they were repairable unlike the non-repairable fracture seen with cast posts. Conclusion: The results of this study showed that, fracture strength and mode of failure in anterior teeth with flared canals varied according to the type of post used to support a crown. Restoration of the mutilated endodontically treated tooth is a subject that has been evaluated and discussed widely in dental literature. ,,, The endodontically treated tooth is a unique subset of teeth requiring restoration due to the loss of the tooth structure, altered physical characteristics by the altered collagen cross linking, dehydration, altered esthetic characteristics of the residual tooth and the impaired neurosensory feedback mechanism. Esthetic, functional and structural rehabilitation of a pulpless tooth is critically important to ensure a successful restorative outcome. Thus, the present study is conducted to compare the fracture strength of endodontically treated teeth with flared canals restored with two pre fabricated fiber-reinforced resin systems (one glass-fiber reinforced resin system and one quartz reinforced resin system) and one custom cast base metal (Ni-Cr) system. The null hypothesis was that the fracture strength and mode of failure of endodontically treated flared single-root teeth does not vary as a function of the post system. Forty five freshly extracted human maxillary central incisors free of cracks, dilacerations, caries and fractures were selected for the study. All external debris was removed and the teeth were stored in saline solution at room temperature to prevent dehydration before and during experimental procedures. The anatomic crowns of all the teeth were sectioned horizontally to the long axis, at cemento-enamel junction (CEJ), to obtain a root length of 15mm. Teeth with mesio-distal width of 5-5.5 mm and bucco-lingual width of 7-8 mm were selected for standardization purpose using vernier-caliper. The canals of all teeth were prepared chemomechanically by step-back technique. After endodontic instrumentation up to file size #40 using Hedstrom files (Mani Inc, Japan) and K-flexofile (Dentsply, PA, USA), they were rinsed with 3% sodium hypochlorite and 5% sodium thiosulfate was used to neutralize the irrigant. All canals were obturated with gutta-percha (Dentsply Maillefer, USA) and AH Plus sealer (Dentsply Int. Ltd. Maillefer, USA). Canal entrances were sealed with glass ionomer cement and teeth were stored in physiological saline at 4΀C. 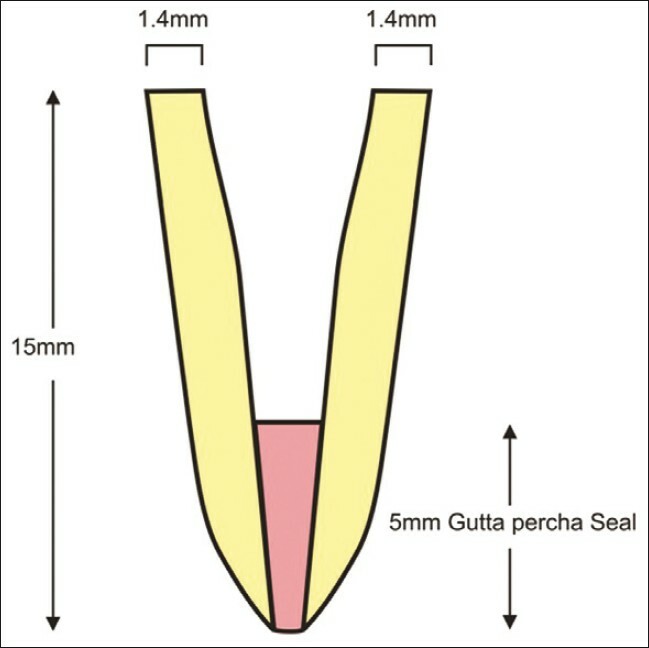 After 48 h, the gutta-percha was removed using a #2 Peeso reamer (Mani Inc, Japan) until a depth of 10 mm, leaving 5 mm of gutta-percha at the apex. For standardization, post space preparations were done using #2 Tenax post drills (#2, 1.3mm in diameter, Coltene Whaledent, USA) in all the roots. To simulate the flared root canal, the root canal entrances were enlarged with a diamond point (# 210038 ST, Swiss Tec), with a length of 5 mm and diameter of 2.0 mm at the center [Figure 1]. The prepared roots were randomly divided into 3 groups (n=15 per group) based on the material used for manufacturing the post. Group 1 - Cast metal post (Ni-Cr) as control. Group 2 - Glass fiber post (Parapost, Coltene Whaledent, USA), 1 and 1.5 mm in diameter with passive taper. Group 3 - Quartz fiber post (D.T. Light-post; Recherches Technique Dentaires, RTD, St. Egreve, France) with same dimension and shape used in Group 2. In Group 1 specimens, cast posts were obtained by using burnout inlay wax. Final wax pattern had an intraradicular portion of 9 mm with a passive taper and core height of 6 mm. The core was shaped to simulate incisor preparation for the full crown. Then wax patterns were cast with Ni-Cr alloy. After finishing the core, 30 matrices of polyester were fabricated to reproduce core shape using the Adaptus system (Bego, Bremen, Germany) to be used for composite cores in Groups 2 and 3. In this way, all cast and composite cores were standardized to obtain similar dimensions. All posts were cemented with Rely X luting cement (3M ESPE, MN, USA) using one bottle adhesive (Single Bond, 3M ESPE) according to manufacturer's instruction. Cement was placed on the post and seated under finger pressure. The loading pressure was released and the post was gently reseated and held in place until final setting of the cement. This ensured that, the intraradicular space not occupied by the post was filled with resin cement during post cementation. In Groups 2 and 3, the fiber-reinforced posts were cut, leaving 6 mm above the root canal entrance to retain a composite core. The matrices that were fabricated to reproduce the coronal shape from Group 1 were filled with micro hybrid composite resin (3M) and used in Groups 2 and 3 to build up cores. Polymerization of resin was performed according to manufacturer's instructions. The full crowns were fabricated with wax over one specimen to a shape of incisor and casted with a Ni-Cr metallic alloy (Wiron 99, Bego, Bremen Germany) maintaining a height of 8 mm and thickness of 3 mm. Polyester matrices were fabricated over this crown using Adaptus system to standardize the crown dimensions. All Ni-Cr crowns were cemented with zinc phosphate luting cement (Harvard Inc.). Root surfaces were marked 2 mm below the cement-enamel junction and covered with 0.6 mm thick foil. All specimens were embedded in acrylic resin poured into molds made of same material (30 mm height and 22 mm in diameter). The teeth were embedded along the long axis and placed in water bath during polymerization of the resin. After the first signs of polymerization, the teeth were removed from the resin blocks along the long axis and the spacers were removed from the root surfaces. Silicone-based impression material was injected into the acrylic resin blocks and the teeth were reinserted into resin cylinders. A standardized silicone layer that simulated periodontal ligament was thus created. Each specimen was placed in a custom apparatus that allowed the specimens to be positioned at 45΀ to the long axis to closely approximate loading conditions applied in vivo. The specimens were subjected to loading at this orientation on palatal surface in a universal testing machine (Lloyd Instruments, 50 HK, USA). A crosshead speed of 0.5 mm/min was applied until failure. The load was measured in Newton's (N). A failure was defined as fracture of the core material with displacement from the post head or fracture of the core or that of the tooth. The mode of failure was recorded and classified as repairable (displacement of crown, cervical fracture which would allow repair) and non-repairable (fracture of the root which is non-restorable). The data were analyzed with one-way analysis of variance (ANOVA) to determine the overall difference among the mean values of the test groups and the overall variability within test groups. Tukey multiple comparison test was used to determine which test groups were statistically different from the others. All testing was done with alpha equal to 0.5. Mean fracture strength and mode of failure were calculated for all groups [Table 1]. The highest mean fracture strength (N) was recorded in Group 1(cast post and core) followed by Group 3 (Quartz-fiber) and Group 2 (Glass-fiber). There was a significant difference between the groups with regard to fracture strength as it was evident in the ANOVA analysis (P<0.0001). Post hoc test was done to identify the significant difference among the groups, the Tukey test showed that, the mean difference was significant at (Alpha=0.05) 5% level. There was a significant difference between Groups 1, 2, and 3. Groups 2 and 3 were not significantly different. The failure in the form of repairable and non-repairable [Table 2] showed that only 13.34% was repairable and 86.66% was non-repairable fracture in Group 1 whereas fracture repairable was 100% in case of both Groups 1 and 2. In the present in vitro study, an attempt has been made to compare the fracture strength and mode of failure of endodontically treated teeth with flared root canals restored with conventional post core and fiber-reinforced resin post. This lower fracture strength compared with the values of cast metal posts may be attributed to the displacement or fracture of the resin cement layer, composite core, or resin post during mechanical testing. This study tested teeth simulating the loss of root canal dentine at the cervical third, which may have contributed to reduced fracture strength of the experimental groups, in comparison with other studies that used cast and prefabricated posts in uni-radicular teeth. Studies tested several methods of reinforcement for flared root canals and also obtained higher values of fracture strength than values recorded in the present study. In their study, bovine incisors were restored with Pre-fabricated metallic posts without crowns. As different materials and methods have been used to test the fracture strength of endodontically treated teeth, direct comparison of results is not always possible. As described by Assif et al,  complete crown coverage with a 2 mm ferrule on sound tooth structure changes the distribution of forces to the root and post and core complex. In this study, no ferrule was used because it is often hard to find axial cervical tooth structure in flared root canals to be used for an efficient ferrule effect. This in vitro study has limitations as the tests were carried out in single rooted teeth, with specific dimensions and post preparation, under a static compressive loading applied at a single point and at a fixed angulation. Thus, dynamic or fatigue behavior cannot be inferred. The ultimate clinical decision making should also consider patient-related variables such as occlusion, masticatory force, level of alveolar bone attachment and para-functional habits, to maximize the long-term prognosis of endodontically treated teeth with flared canals. A further large-scale research in this field is required before anything can be deemed ultimate for the clinical use. Additional in vivo and in vitro studies are required for the long-term results. Within the limitations of this study, fracture strength and mode of failure in single rooted teeth with flared roots varied according to the type of post used to support a full crown. The use of conventional post and core system should be avoided in structurally compromised tooth. Teeth restored with cast posts had fracture strength twice that of teeth restored with glass or quartz fiber reinforced resin posts, but most fractures would not allow preservation of the teeth. Teeth restored with fiber-reinforced resin post failed at a compressive force comparable to clinical conditions, although root fractures would be repairable. The authors thank Mr. Gopalan for providing the opportunity to carry out the procedure in R.V. Composites institution Bangalore. We are also grateful to Mr. Chandrappa for his help in statistical analysis. 1. Mannocci F, Qualtrough AJ, Worthington HV, Watson TF, Pittford TR. Randomized clinical comparison of endodontically treated teeth restored with amalgam or with fiber-post and resin composite: Five year results. Oper Dent 2005;30:9-15. 2. Salvi GE, Siegrist Guldener BE, Amstad T, Joss A, Lang NP. Clinical evaluation of root filled teeth restored with or without post and core systems in a specialist practice setting. Int Endod J 2007;40:209-15. 3. Sorensen JA, Martinoff JT. Intracoronal reinforcement and coronal coverage: A study of endodontically treated teeth. J Prosthet Dent 1984;51:780-4. 4. Kamat S, Goel BR. Restoration of teeth with highly flared canals: An Overview of Post and core systems. J Conserv Dent 2002;5:12-3. 5. Tiat CM, Ricketts DN, Higgins AJ. Weakened anterior roots - intraradicular rehabilitation. Br Dent J 2005;198:609-17. 6. Duret B, Reynaud M, Duret F. New concept of corono-radicular reconstruction: The composipost. Chir Dent Fr 1990;60:131-41. 7. Isidor F, Brondum K, Ravnholt G. The influence of post length and crown ferrule length on the resistance to cyclic loading of bovine teeth with pre-fabricated titanium posts. Int J Prosthodont 1999;12:78-82. 8. Boudrias P, Sakkal S, Petrova Y. Anatomical post design meets quartz-fibre technology: Rationale and case report. Compend Contin Educ Dent 2001;22:337-40. 9. Peroz I, Blankenstein F, Lange KP, Naumann M. Restoring endodontically treated teeth with posts and cores - a review. Quintessence Int 2005;36:737-46. 10. Saupe WA, Giuskin AH, Radke RA Jr. A comparative study of fracture resistance between morphologic dowel and cores and a resin reinforced dowel system in the intraradicular restoration of structurally compromised roots. Quintessence Int 1996;27:483-91. 11. Yoldas O, Akova T, Uysal H. An experimental analysis of stresses in simulated flared root canals subjected to various post-core applications. J Oral Rehabil 2005;32:427-32. 12. Akkyan B, Gulmez T. Resistance to fracture of endodontically treated teeth restored with different post systems. J Prosthet Dent 2002;87:431- 7. 13. Newman MP, Yaman P, Dennison J, Rafter M, Billy E. Fracture resistance of endodontically treated teeth restored with composite posts. J Prosthet Dent 2003;89:360-7. 14. Fokkinga WA, Kreulen CM, Vallittu PK, Creugers NH. A structured analysis of in vitro failure loads and failure modes of fiber, metal and ceramic post-and-core systems. Int J Prosthodont 2004;17:476-82. 15. Kathuria A, Kavitha M, Khetarpal S. Ex vivo fracture resistance of endodontically treated maxillary central incisors restored with fiber-reinforced composite posts and experimental dentin posts. J Conserv Dent 2011;14:401-5. 16. Narang P, Sreenivasa Murthy BV, Mathew S. Evaluation of two post and core systems using fracture strength test and finite element analysis. J Conserv Dent 2006;9:99-103. 17. Sirimai S, Riis DN, Morgano SM. An in vitro study of the fracture resistance and the incidence of vertical root fracture of pulpless teeth restored with six post and core systems. J Prosthet Dent 1999;81:262-9. 18. Sidoli GE, King PA, Setchell DJ. An in vitro evaluation of a carbon-fiber-based post and core system. J Prosthet Dent 1997;78:5-9. 19. Anusavice KJ. Mechanical properties of dental materials (Chapter 4). In: Phillips' Science of Dental Materials. 10 th ed. Philadelphia; WB Saunders Co.;1996. p. 49-74. 20. Maccari P, Nunnes C. Fracture resistance of endodontically treated teeth restored with three different prefabricated aesthetic posts. J Esthet Restor Dent 2003;15:25-31. 21. Yoldas OT, Akova T, Uysal H. An experimental analysis of stresses in simulated flared root canals subjected to various post-core applications. J Oral Rehabil 2005;32:427-32. 22. Marchi GM, Paulillo LA, Pimenta LA, Delima FA. Effect of filling materials in combination with intraradicular posts on the resistance to fracture of weakened roots. J Oral Rehabil 2003;30:623-9. 23. Assif D, Bitenski A, Pilo R, Oren E. Effect of post design on resistance to fracture of endodontically treated teeth with complete crowns. J Prosthet Dent 1993;69:36-40. Cho, I.-S. and Kim, T.-W. and Ahn, S.-J. and Yang, I.-H. and Baek, S.-H.
Bacchi, A. and Fernandes Dos Santos, M.B. and Pimentel, M.J. and Caetano, C.R. and Sinhoreti, M.A.C. and Consani, R.L.X.